Donna’s Old Town Cafe, LLC is a local, family-owned and operated restaurant located in historic downtown Madisonville. Open since October 24, 1994, the owners renovated the old Bank of Madisonville, which was built in the 1800’s, into a restaurant unusual in design and decoration. The ceiling has original metal impressed with a beautiful floral design in each square. 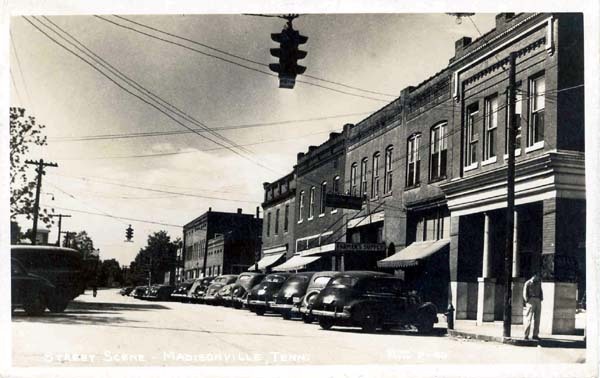 Historic pictures of downtown Madisonville hang about the walls as well as a drawing of the historic Monroe County Court house, which is located directly across the street, and sketches of local churches adorn the walls as well. The decorations change with the holidays and are magnificent. The restaurant is known for its excellent iced tea, fresh baked rolls, and homemade desserts, especially the peanut butter pie and blackberry cobbler. The restaurant has built its reputation on its hospitality, service and cleanliness. You can order from an extensive menu and the buffet is always filled to the brim — never an empty bowl! Hot soup is a lunch and dinner staple. The upstairs banquet room seats more than 100 guests. The Madisonville Kiwanis Club makes its headquarters in the banquet room each Tuesday and lunch is catered by Donna and her staff. The restaurant also caters parties and receptions in the banquet room and in your home, church or business — for all your special occasions. Come visit Donna’s Old Town Cafe in Madisonville and just relax, enjoy the great food, service and good ‘ole Southern Hospitality.